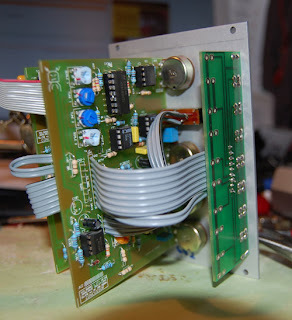 This came to me recently along with some Doepfer modules... "it doesn't work, any good to you?" - well, yeah, I said! 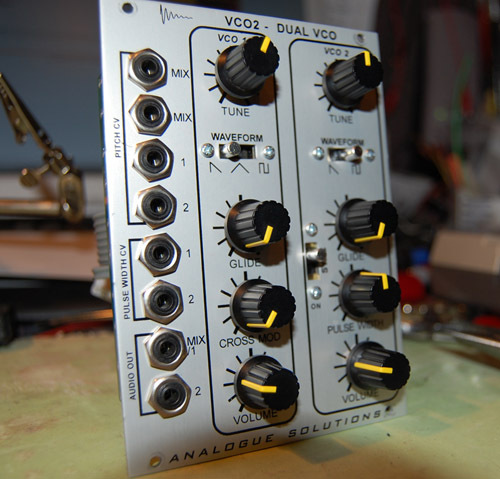 It's an interesting one, the VCO2 from Analogue Solutions... apparently discontinued... it's a dual VCO with some nice features - portamento on both oscillators, sync and cross mod, osc 1 has a wide range that allows it to function as an LFO, and independent or linked CV pitch control. ...it didn't work, no surprises there, but two hours & several new parts later it burst into life... highly likely it had been 'plugged in the wrong way round'. 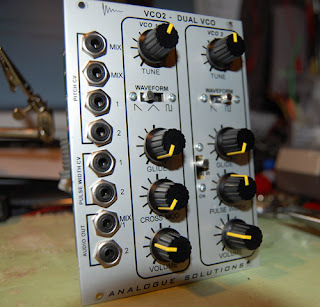 It sounds nice & raw, similar to Rogue or Prodigy VCOs. Oscillator 1 has saw, tri & square waves ... oscillator 2 has saw and variable pulse waves and can be synced and cross-modulated with osc 1 creating some really dynamic sounds. It's fairly stable and the tracking is not bad... what you'd expect from a 3046 based VCO I guess.